Artemide Modern Soffione Terra/Floor Halogen Floor Lamp Mod. 45 by Michele De Lucchi - The Soffione 45 is a floor standing luminaire for diffused halogen lighting designed by Michele De Lucchi for Artemide. It has a diffuser shape similar to the geometric structure of crystals. The floor lamp diffuser is in a white handblown glass with a polished silk finish. 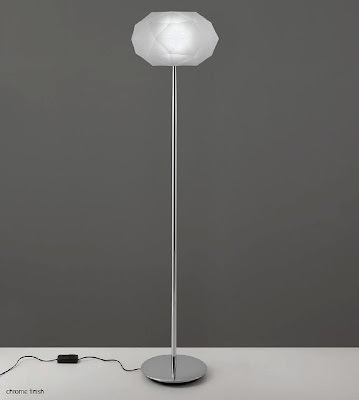 The lamp base is in die-cast aluminum with a steel stem. 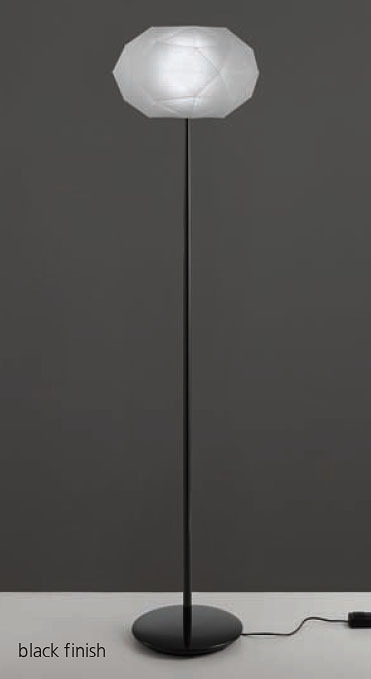 The base and stem are available in a polished black or polished chrome finish. The Soffione 45 floor lamp has a dimmer switch on the cord. This floor lamp creates a spectacular light. Like a glowing crystal it lights up a room with soft ambient light.